OK place, a little overpriced $25.00. The weeds were pretty bad in the rv park. WIFI good, Laundry good, Overall an OK place to stay over nite. We could not get thru the main gate with a rv had to use the far gate about 2 miles away. If you need a sticker for the windshield you need to go to the bldg. outside of the main gate before entering the base. 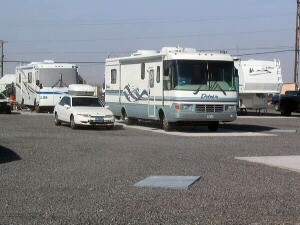 (There is a small parking no place to park a rv).